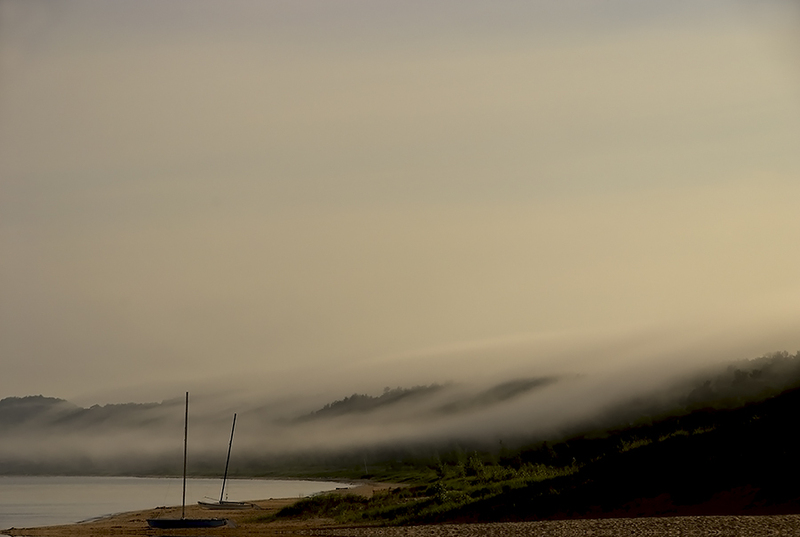 6:30 a.m., May 28, fog had settled into the dunes north of the small town of Pentwater, Michigan. It was a phenomenon unlike any I had seen in the forty-seven years I had walked these eastern shores of Lake Michigan. Occasionally, fog banks would descend obscuring the contours of the landscape but this time fog clung to the division between each dune, exposing only the tops of white pine and sporadic clumps of tag alder. As remarkably, three quarters of the scene and subsequent image were sky, tinged with subtle, almost imperceptible hues of color as it spreads its fingers across the dunes down to the beach. It brings the quality of “impermanence” to mind – a key dimension of the Japanese art of Wabi Sabi. Within minutes the long fingers had receded, replaced somewhat ironically by the forest; its own beauty transient and ineluctably transformed as day ascended. This is one of the images from my 2011 exhibit at the Butler Institute of Art. It has been a popular limited edition print over the last eight years but this is the first occasion I’ve printed it as a large canvas (40″x60″). We have it on view for one more week (thru Sat. Feb. 25) at the gallery.